Banners are great for your Business, School, Social Club, Church, Sports Team or Real Estate Company. You can Design your own custom banner using our Online Designer or have us design a professional banner for you. Our banners are digitally printed on Industry leading 15oz material and finished out with reinforced edges and grommets at no extra charge. Design your custom banner using our Online Designer or have us design a professional banner for you. Our banners are digitally printed on industry leading 13oz material and can be finished out with grommets for hanging. We also offer an option to upgrade your quality to a 20oz banner material for those longterm outdoor applications. Printed on Industry Leading 13oz material. Longterm Indoor Durability (5-7 Years) / Outdoor (4-6 Months). Printed with weatherproof ECO-Friendly UV Inks. Upgrade to a 20oz material for longer Outdoor Durability. We do not suggest using 13oz banners for long term outdoor use. If you are looking for a long term solution, please upgrade to the 20oz Outdoor Banner option. Our outdoor banner material is an Industry Leading 20oz scrim vinyl banner. Compared to our competitors 13oz banners, our material is heavier and much more durable in the elements. 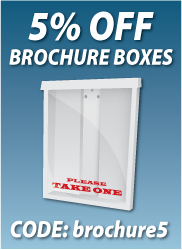 For use as a hanging advertisement or commercial building signage.